The Input control allows a single line of input text. It has optional headers, footers and other features. 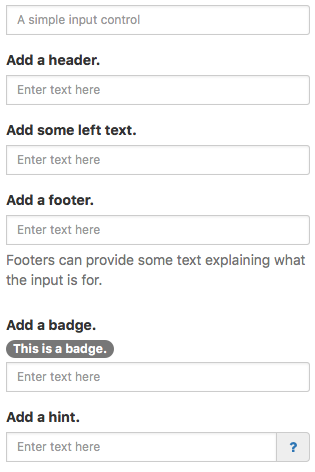 Note that Input (Bootstrap) does not have .text property. Use .value to get the value of the control. autocapitalize Automatically capitalize first letter? May not be available on other platforms. 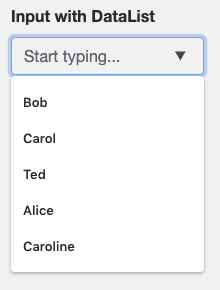 autocomplete Automatically complete words? May not be available on other platforms. autocorrect Spellcheck as entering? May not be available on other platforms. datalist List of possible predefined values, one per line. Bootstrap 4 only. Design Time and Runtime. disabled If true, grays out the input area and prevents changes. Design Time and Runtime. files Array of files chosen if inputType is 'file'. Runtime. focus() Sets the focus to the TextBox. Runtime only. header An optional message at the bottom of the list of items. Design Time and Runtime. headerCols Width to be allocated to the header. Can be from 0 to 12. Default is 2. headerCols + valueCols must equal 12.
icon An optional icon to appear at the right of the input field. Design Time and Runtime. inputmode Specifies what kind of keyboard should display on mobile devices. Not all browsers support all types. Bootstrap 4 only. Design time. (empty) Use the default keyboard. none This keyword is useful for content that renders its own keyboard control. text Display keyboard capable of text input in the user's locale. tel Display keyboard capable of telephone number input. This should including keys for the digits 0 to 9, the '#' character, and the '*' character. In some locales, this can also include alphabetic mnemonic labels (e.g., in the US, the key labeled '2' is historically also labeled with the letters A, B, and C). url Display keyboard capable of text input in the user's locale, with keys for aiding in the input of URLs, such as that for the '/' and '.' characters and for quick input of strings commonly found in domain names such as 'www.' or '.com'. email Display keyboard capable of text input in the user's locale, with keys for aiding in the input of e-mail addresses, such as that for the '@' character and the '.' character. numeric Display keyboard capable of numeric input. This keyword is useful for PIN entry. decimal Display keyboard capable of fractional numeric input. Numeric keys and the format separator for the locale should be shown. search Display keyboard optimized for search. inputType Specifies what kind of data will be input. Choices are color, date, datetime, email, file, hidden, month, number, password, range, search, tel, text, time and url. Default is text. Not all browsers support all types. Design time. leftText Text to appear in the left side of the input box. Does not display if container < 768 pixels. max If inputType is numeric, the maximum allowed value. For date, the latest date in the format YYYY-MM-DD. maxlength Maximum number of input characters. Does not apply to numeric: use max instead. min If inputType is numeric, the minimum allowed value. For date, the earliest date in the format YYYY-MM-DD. placeholder Text to be displayed in the field just as a comment – does not change the value. readonly If set to “True”, the control cannot be edited. At runtime, use readOnly. required If set to “True”, the field requires a value when the form is submitted. Design time only. setSelectionRange(start, end) Selects a range of characters. The first character starts at 0. Runtime only. size Size of input text: small or large. Header and footer size is controlled by fontSize. Design time only. spellcheck Check spelling and grammer? value Gets or sets the value (true or false) of line i. Runtime. valueCols Width to be allocated to the value. Can be from 0 to 12. Default is 10. headerCols + valueCols must equal 12. Standard events are supported. For this control, the onfocusout event will be useful. It gets called when the user changes the focus to another field. Call a function when user is done editing field. This page was last edited on 28 March 2019, at 17:22.